Before she came as Shri Mahalasa Narayani to Gomantak, now known as Goa, the beloved Goddess was resident of this small village called Nevase in Maharashtra’s Ahmednagar district, for a long, long time. However, She was, and is still, known as “Mohiniraj”, in all Her glorious incarnation as Mohini of the Samudra Manthan fame. Shri Mahalasa Narayani is present in the form of Ardha Nari Nateshwari, since the right half of the idol has masculine characteristics, i.e, of Lord Vishnu. Nevase is also known as the “sasurwadi” or father-in-law’s home of Lord Khandoba of Jejuri, an incarnation of Lord Shiva. Shri Mohiniraj is the first wife of Lord Khandoba, the other being Parvati. (For more see Chronicles). Shri Mohiniraj’s temple was constructed during the reign of one Shri Gangadhar Yashwant Chandrachud, a Jagirdar in the year 1773. Later, Muslim invaders smashed the temple and threw the idol into the Pravara river. In the beginning of nineteenth century, the Goddess appeared in a devotee’s dream, wherein she asked him to recover the idol from the river and re-install it. The temple itself is constructed in the Hemadpathi architectural style, the only such temple in the country. The 75-feet tall temple is decorated all over with exquisite carvings and ornamental work. Nevase became Kadambavaree Mahalasa’s residence. 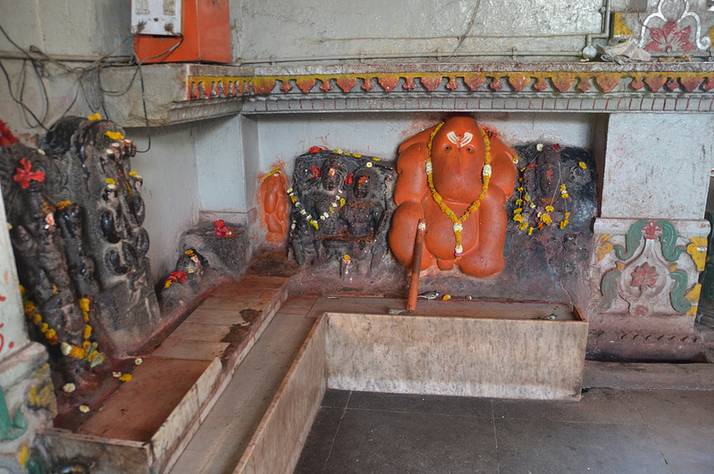 Within the Sabhamantap, idols of Lord Ganesha, Shiva-Parvati, Shani and Hanuman are also installed and worshipped. According to historic records, during the Nizamshahi reign, the famous Maratha general Shahaji Raje Bhonsle used to stay at Nevase regularly when Verul was his head-quarters. He had given many grants to the temple of Mohiniraj. It may be pertinent to note here that Shahaji Raje was the father of the famous warrior-king, Chhatrapati Shivaji Maharaj. After the death of Aurangzeb, it came under the sway of Holkars and was conferred upon Shri Gangadhar Yashwant Chandrachud, the nobleman of the Holkars, as Jagirdar (landlord). Consequent upon the differences he had with Malharrav Holkar, his diwanship of Wai was confiscated and he was externed from Wai. Having been in the knowledge of the prowess of Mohiniraj he prayed to the Goddess that he would construct a fine temple if he got back the diwanship of Wai. The Goddess answered his prayers and Chandrachud was reinstated as the diwan of Wai following an agreement reached between Malharrav Holkar and the Peshwa. The Peshwa sanctioned an annual grant of Rs 1,500 to the temple, which the temple was getting up to 1860, when it was discontinued by the Inam Commission in 1861. Later on, the British Government sanctioned a grant of Rs 248 to the temple annually. Today, the expenditure of the temple is met from the income received from the land owned by the temple trust. Shri Mahalasa Narayani or Shri Mohiniraj at Nevase is the inspiration behind the famous poet-philosopher and saint Dnyaneshwar, who wrote the Bhavartha Deepika, more popularly referred to as Dnyaneshwari, an immortal, yet powerful commentary on Shrimad Bhagwadgita, in the 13th century. Sant Dnyaneshwar referred to Nevase as Niwas and described it as a place extending 10 miles (five kos) near the Godavari and as the abode of Mahalaya (Shri Mahalasa), in the kingdom of the Devagiri Yadav King Ramchandra (1271-1310). His commentary bears the date 1290. Nevase, or Newasa or Newasa Khurd as it is officially known, is 20 miles from Shrirampur railway station and is connected to it by road. A branch road, three miles in length, taking off from mile No. 34.6 on the Ahmednagar-Aurangabad road leads to Nevasa. The historic names of this tehsil are Newasa, Nidhinivas Nivas, Nivas and Mahalaya.